ARTBA is a federation of eight divisions representing the public and private sectors of the transportation design and construction industry. The membership structure provides a dynamic forum for policy development and discussions, and business development. 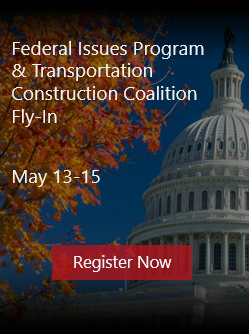 Meet at least two times a year, including at the ARTBA Federal Issues Program and the National Convention. The Traffic Safety Industry Division meets at the National Convention and twice in conjunction with the January and June meetings of the AASHTO Traffic Engineers Committee and the National Committee on Uniform Traffic Control Devices. Conduct regular Infostructure™ webinars to keep informed on environmental issues and regulations, safety, contract administration, P3s, project delivery, economic trends and market conditions, and legal matters. Host events to meet the needs of the respective members such as the Annual P3s in Transportation Conference, the Planning & Design Division events at the AASHTO Regional Meetings, and the Transportation Construction Law & Regulatory Forum. Hold regular conference calls to receive federal legislative and regulatory updates, and gather intelligence about market conditions. Provide opportunities to connect with peers and partners to develop relationships that lead to new business partnerships. Contractors—Firms in all areas of transportation construction work, including highways and bridges, public transit, airports, railroads, ports and waterways. Planning & Design—Large and small private sector engineering firms engaged in the planning and design of transportation facilities. Transportation Officials—Public transportation officials at all levels of government including federal, state, city and village and county and rural. Materials & Services—Professional firms and associations involved in the manufacturing, processing, and distribution or sales of non-safety related materials as well as firms that provide professional, technical or promotional services to the transportation construction industry. Traffic Safety Industry—Companies involved in the design, manufacture, distribution, sale and maintenance of equipment, devices and materials that are used to enhance worker and motorist safety on roadways. P3s in Transportation—Firms playing a leadership role in the area of public-private partnerships in the construction, design and operation of transportation facilities. Visit www.artbap3.org for more information. Research & Education—Leading university engineering professors and transportation researchers and educators. Manufacturers—Non-safety related manufacturers of heavy construction equipment.